52 weeks in a year might seem like a lot of time for businesses to adjust their marketing strategies and improve their sales. But increased use of the Internet among consumers has created a disconnection between customers and businesses who haven’t made themselves easy to find on the web. Here are the three most common, and painful types of sales that are lost by businesses; lost sales that many businesses are often unaware of. The first lost sale happens when a business moves to a new location, changes their contact information (phone and email), or changes their business hours, but they forget to update their new information on Google Place. And since a majority of consumers today use smartphones, Google searching for providers is how they find businesses, not driving to a location. So, if a business fails to update their address or contact information on Google Place, potential customers would be frustrated if they were to drive to the old address and discover that there’s no business there. Imagine how many sales are lost annually to businesses in this situation. To see if your business has this problem, go to Google Place and look up your business name. If everything listed in Google Place about your business is correct, you’re good to go. However, if your business information is not listed on Google Place or the information is not up-to-date, you should have a search engine marketing (SEM) firm register or correct this for you soon. The longer you wait, the more sales you could lose each day. The second type of lost sale happens when businesses have out-of-date websites. Since your website is the first thing customers will learn about your business, an out-of-date website will often turn off potential customers. Consumers often attribute a sloppy website, with a sloppy business. Therefore, it’s very important that you establish a quality website to present yourself professionally, 24-7. And make sure your website is simple, clean, and user-friendly. You want your online viewers to navigate your website easily, and understand what you do quickly. Today, many businesses lose sales because their website doesn’t communicate effectively to their customers. To stop losing sales in this way, contact a professional web design company and have them redesign a responsive website for your business. The third type of lost sale happens to businesses that do not have a website. This may sound surprising, because most of us wonder how a business can be found by customers without a website. One might argue that if a business operates 100% on word-of-mouth referrals, then it doesn’t need a website. That is not correct. Today, consumers expect every business to have a professional website they can find easily. People want to learn about potential providers before they contact them. Also, what if customers (after they get a referral) want to use Google Map to find your business? That said, if a business does not have a website, regardless of what kind of business it is, that business is losing touch with its customers day by day as consumers use the internet more and more to find and communicate with their providers. 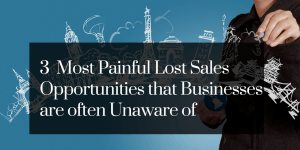 These are the three most painful lost sales opportunities that many businesses are unaware of. If you want to address these issues but don’t know where to begin, please call our web design firm at (507) 581-9451 for a free consultation.